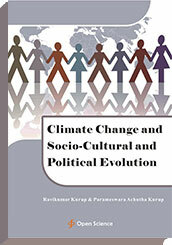 Global warming and extremes of climate change can lead to social, political and cultural changes based on alterations in human biology. Climate change leads to increased endosymbiotic archaeal growth and secretion of RNA viroids. The viral epidemics have thus contributed to human evolution. Virus and bacterial infection homogenized human population by gene transfer. The archaeal and its RNA viroids form the lynchpin of the mechanism of gene transfer. This leads onto globalisation of speech, thought and culture by viral epidemics and related gene transfer. Thus viral epidemics help in globalization of human culture. Human viral epidemics are necessary prerequisite for the evolution of human culture.